Bromfiets, Brommers, Bakbrommers - Carrier, Fiets. HOENSON D. Hoenson & Co NV, Amsterdam. Continuation of the Dutch brand Ranger. ^ NL main. Hoenson is equipped with HMW-, Express- or Myster engine. HOENSON SUPER DE LUXE 49 cc EXPRESS Particuliere prijs f 585. 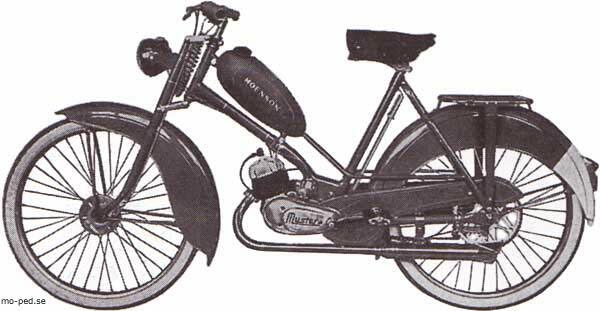 Hoenson / Express: Well-kept chassis with Peerless fork, frame tank, wide fenders streamlined, suspended saddle. chrome exhaust, side stand, patented chain tensioners, 25 "wheels, make Hoenson Express to one of the most modern of our time. HOENSON SUPER DE LUXE EXPRESS 49 cc with 2 gears Private f 650 price. 23 "wheels, a moped with excellent quality and with all the luxury of a modern moped. The Express Hoenson with 2 speed is the big success in 1955. 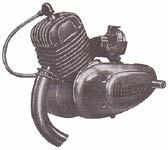 HOENSON SUPER DE LUXE 49 cc MYSTER Particuliere prijs f 495. 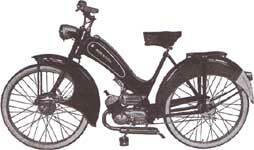 Myster motor is from the French motor industry. A very successful design, which also very beautiful design and excellent technical characteristics, is sold in the Netherlands with great success. 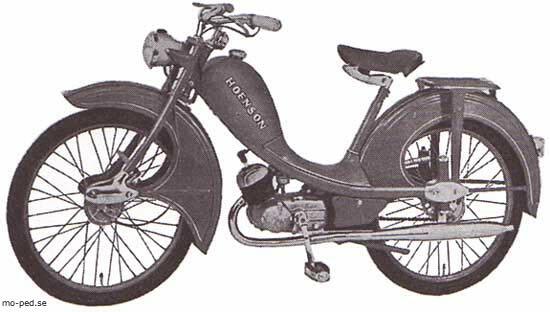 The Hoenson moped, with 25 "wheels, belongs to a class of its lowest priced mopeds in luxury - a modern moped, as requested by the public.